Happy National Hamburger Day! 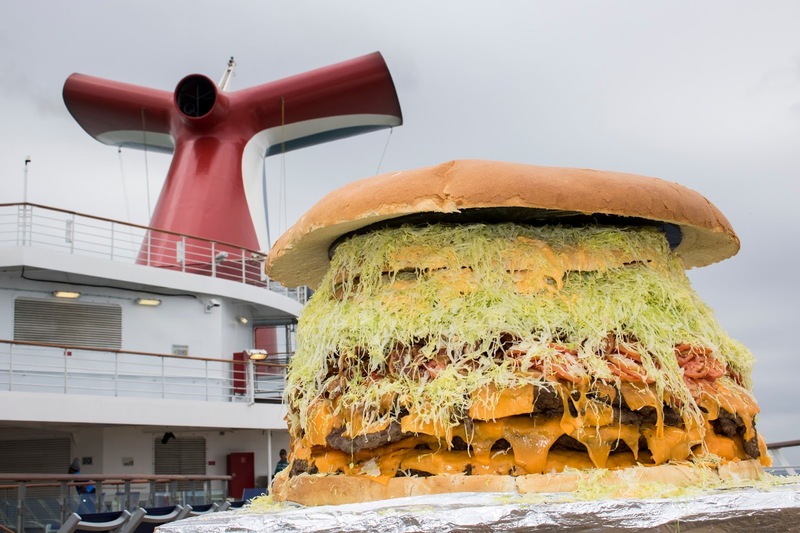 My friends at Carnival took my favorite food holiday to a whole new level by creating a 300-pound, three-and-a-half-foot-wide hamburger. 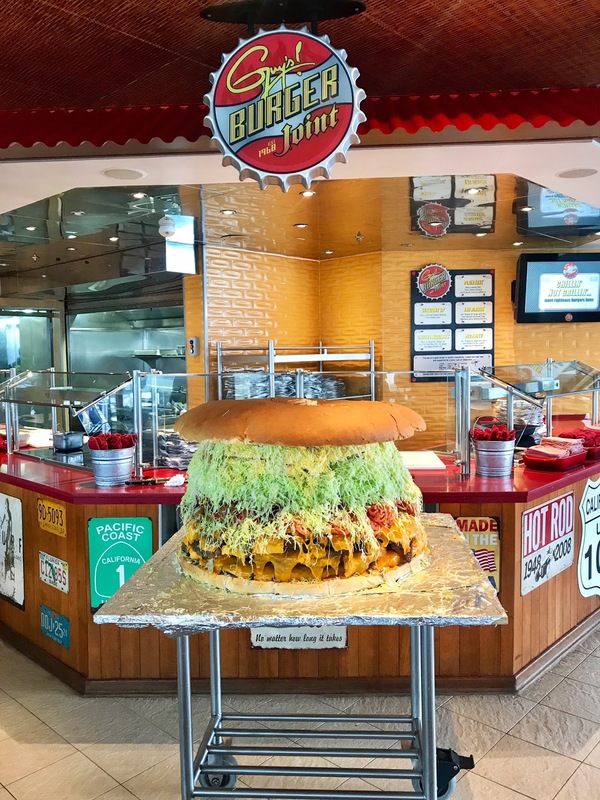 The culinary team on-board the Carnival Liberty (currently sailing out of Port Canaveral) crafted this giant burger, dubbed as the largest hamburger at sea at Guy's Burger Joint. What makes a 300 pound burger? 200 pounds of meat, 50 pounds of toppings and 50 pounds of flour to make the bun. If we're playing numbers, let us talk for a second about how many burgers are made at Guy's Burger Joint each day. There are currently 14 Carnival ships that have a Guy's Burger Joint. It’s estimated that 1,000 burgers are served per day on each ship. Do the math - that is more than 5 million burgers a year (free of charge)! I've had my fair share of burgers from Guy's Burger Joint over the years and they never disappoint. I had an opportunity to learn from the pro's how to make an official Guy's Burger - and they start from tight a ball resembling a giant meatball! I make a ton of burgers at home and would have never known this trick. A burger ball turns into a thin patty using a burger smasher (non-technical term I just made up) and a little arm power. The smashed patty will take 3 minutes to cook on a hot griddle. Add a dash of salt and pepper to the burger and you are on your way to creating a delicious signature Guy's Burger. 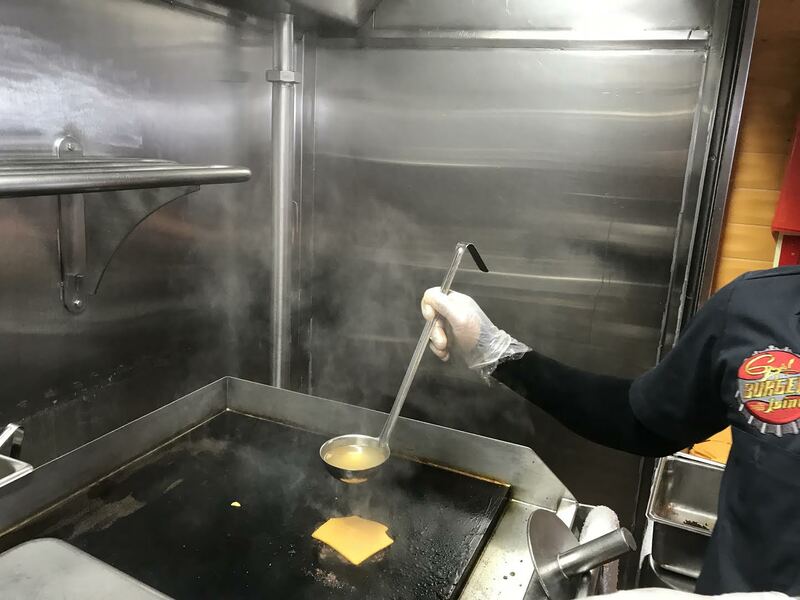 Here's the trick to Guy's Super Melty Cheese (SMC) - they put a little cheese whiz on the burger, about a teaspoon, before putting a slice of cheese on top. Then they use a some chicken stock to create steam to melt the cheese quickly. I don't play by the rules so I crafted two burgers into one. One of my favorite burgers from Guy's is the Chilius Maximus which is a burger topped with an onion ring, Super Melty Cheese (using the trick I described above), Donkey Sauce and Chili. However, coming in close second is the Pig Patty, which is a burger topped with a patty made of crispy bacon. So Why not merge the two together! I never said this was a healthy option. But it is delicious! Carnival released the recipe last year for the Pig Patty Burger, which I have held onto for a year now, waiting for the perfect opportunity to share with you all. The instructions and ingredients to my concoction is included below, just add an onion ring and chili to it! Happy National Burger Day! Make Donkey Sauce: Mix mayonnaise, roasted garlic, mustard, Worcestershire, salt and pepper together until smooth. Yield: about 1 cup. Click here for more information about Guy's Burger Joint and to see all the 14 ships this popular casual restaurants resides at. If you find yourself on a Carnival cruise that offers this delicious treat, do yourself a favor and make it your first stop at sea!